Recognize your super stars. Etched star is gold color-filled with mirror accented bottom. Clear acrylic tapered from 1-1/8" to 7/16" Individually gift boxed. Large and impressive acrylic award featuring a 3/8" thick cast acrylic star upright on a walnut stained Piano Finish base gold aluminum accent. Individually gift boxed. Fireman Award Clock with Antique Bronze Finish Casting. Solid American walnut Fireman award clock with antique bronze finish casting. Laser engravable solid brass engraving plates. Individually boxed. Clock supplied with lifetime guaranteed quartz movement. Fireman Award with Antique Bronze Finish Casting. Solid American walnut Fireman award with fireman's head antique bronze finish casting. Laser engravable solid brass engraving plates. Individually boxed. Fireman Plaque with Antique Bronze Finish Casting. Solid American walnut Fireman plaque with antique bronze finish metal casting. Laser engravable solid brass engraving plates. Individually boxed. Gold Star Paper Weight with Felt Bottom. 5" Jade glass star on a base. 3/8" thick glass, base has protective rubber feet. This glass award is packaged in satin-lined, padded gift boxes. Maltese cross shaped solid American walnut plaque with activity insert. Solid brass engraving plate(s). Individually boxed. See "options" below for available Organizational Inserts. Rosewood Piano Finished plaque with gold Florentine star shower engraving plate. The same production techniques used to give expensive grand pianos their glossy look is available as a recognition award. Over six layers of lacquer are hand applied and polished to create our plaques. Laser engravable solid brass engraving plates. Individually boxed. Rosewood-piano finish award with chrome plated star, brushed silver aluminum base and black aluminum engraving plate. Gift box included. Rosewood Piano Finish plaque, gold Florentine shooting star accent engraving plate. The same production techniques used to give expensive grand pianos their glossy look is available as a recognition award. Over six layers of lacquer are hand applied and polished to create our plaques. Laser engravable solid brass engraving plates. Individually boxed. Star riser metal casting with gold tone finish. Laser engravable plate(s). Black/Silver Star Acrylic Stand Up Plaque with Leatherette Easel boasts a modern design. This acrylic award is perfect for employee awards, achievement awards and sales awards presentations. An excellent choice for your next awards banquet. Black/Gold Star Acrylic Stand Up Plaque with Leatherette Easel boasts a modern design. This acrylic award is perfect for employee awards, achievement awards and sales awards presentations. An excellent choice for your next awards banquet. One point of this 11/16” thick clear crystal 5 ½” star is attached to a faceted clear crystal pedestal and mounted to a black crystal base. 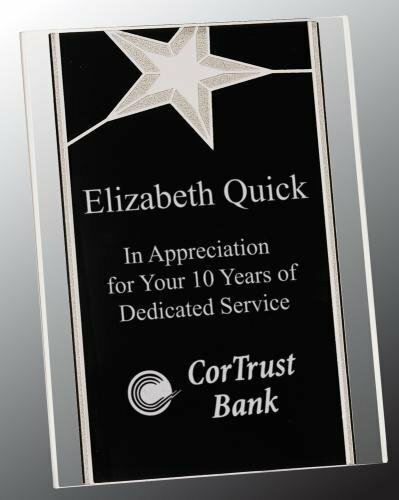 Personalize the star, the base or both for an award to recognize the rising stars in your organization. This premier crystal piece is packaged in a velvet lined gift box. 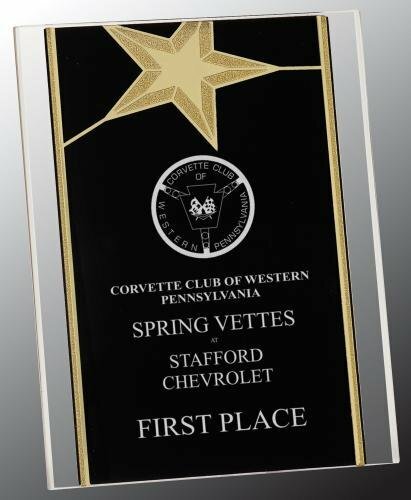 This snappy acrylic award features a star design atop a traditional rectangular acrylic. The combination provides two personalization areas, one within the star and one below the star. The polished brass base offers a touch of regal style along with a sturdy foundation to this simple award. Polished acrylic offers value in a splendid award design.